Definitely one of the better Sauternessfass ripened whiskys. The straight-from-the-cask version did indeed like it better, but this one, too, captures the advantages of the barrel style. The first nose is quite typical sauterness. Sweet white wine, honey, grapes, milk chocolate, sultanas, very sweet pear, apricot, peach, some caramel. The nose is not very complex but I like it well. The sweet-sour fruitiness makes it immediately tasty. very sweet, creamy, fruity, sour, all at once, apricot, some orange or rather tangerine, white wine, blossom honey, milk chocolate, sultanas, banana, some youth still shows. candied fruit, oak, here for the first time bitterness, dark chocolate with a hint of marzipan, it gets drier, the sour-fresh and sweet white wine does not get through, to some nutmeg completes the successful and medium-long finish. 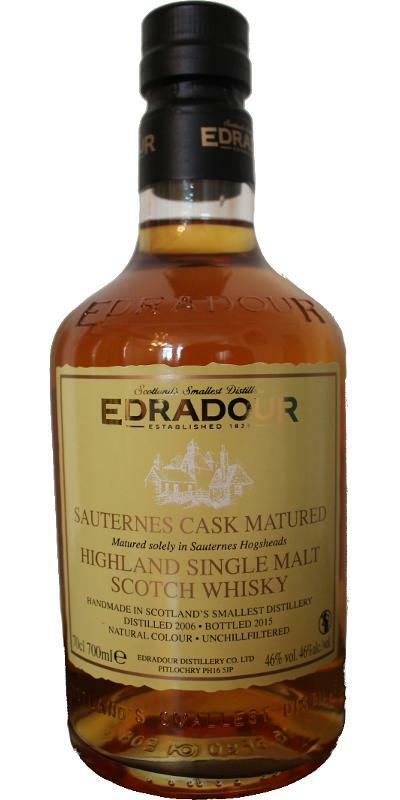 This Edradour spent around 9 years in a Sauternes wine cask. 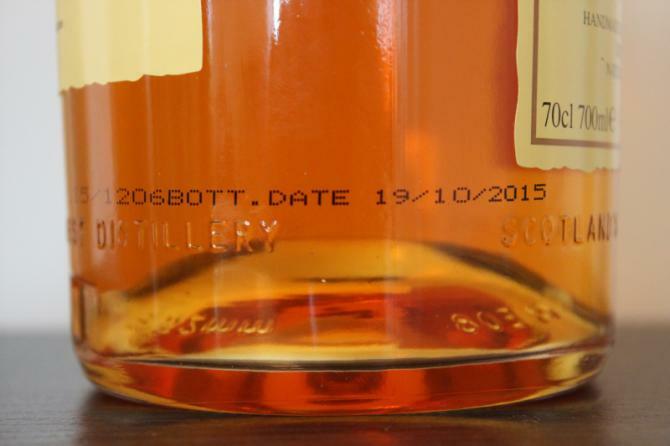 It was distilled in 2006, meaning it is a spirit from the era of Andrew Symington’s team (as they took over the distillery in 2002). Hence I am quite hopeful (as I find previous era Edradour quite disappointing). Hmm, the nose is not all that, mind you. Maybe I should leave it to breathe for a while, for now I get only broth and mustard. Okay, after a few moments of peace it becomes sweet and fruity. Some apricots and dandelion with a twig of mint. Drop of flowery honey. Pinch of cinnamon. That is more like it. The arrival might have been more powerful, to be honest. But the taste is okay. The apricots are joined by peach and even some banana with a hint of sugared orange peel. Quite spicy. Midpalate it goes on a candied tour. Becomes better, but you have to take your time for it. Fairly long, but quite drying finish. After quite an abominal start on the nose, this Edradour recovered quite nicely. The second and third sip were very nice and the finish is more than okay. But you have to leave it for at least three minutes before you put your nose in the glass!